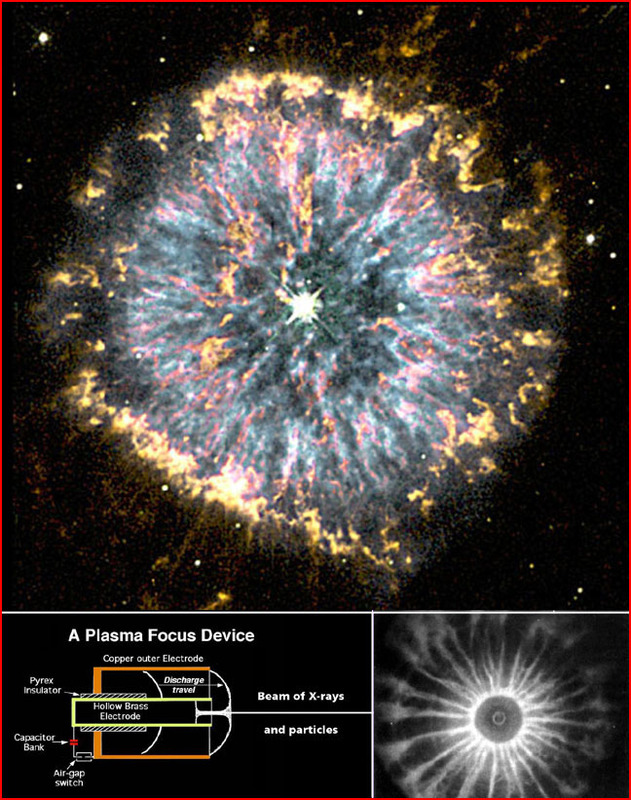 All of the universe affects the rest of it, as all sits in a common bowl of gravitational and magnetically connected and driven mass of ions and regular atoms, that respond to the basic physics detailing the “normal rules or laws”. To think that there are voltages or ions that move without magnetic fields attached violates first principles. The stars are surrounded with a ion shell the heliosphere, that protects them [like ferro fluid particles with oxalic acid coats to keep them from merging as they float around] from running into each other the outer surfaces are composed/covered with free electrons hanging on the outer edge of the magnetic fields. The mutual static repulsion keeps the stars separated just as mutual static repulsion keeps the neutralized moisture in a cloud from condensing. As the background cumulative charge gradient increases it reduces droplet size and polarizes them. With the added side effect of lowering albedo by becoming more transparent to short wave sun light. “In engineering, there are established properties for every material that you use and established specifications for manufacturing processes and analytic procedures. When a model is built, every input is based on solid scientific and empirical ground. But it does not end there. After a design is completed, hardware is built and tested. Data from the tests are used to match the model to the data. I do not see much similarity in the global warming science community. Well, this is it, I just have a few minutes before heading to the Gulbenkian Foundation to register for the event and get to the first session. 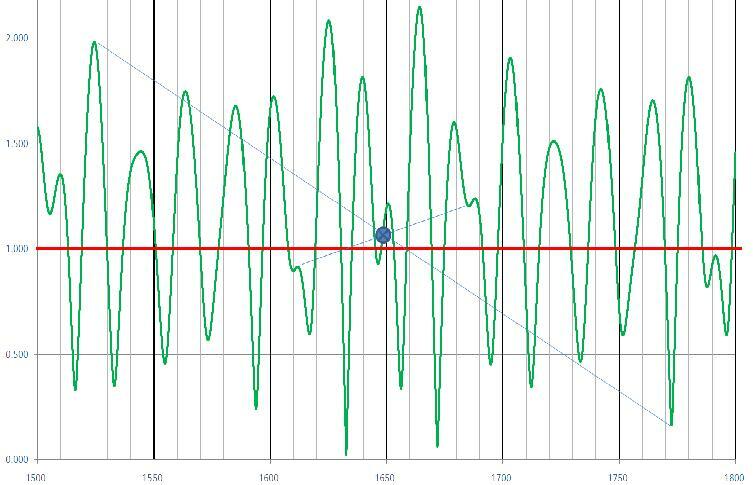 Wild speculation – Will solar cycle 24 peak around this time? 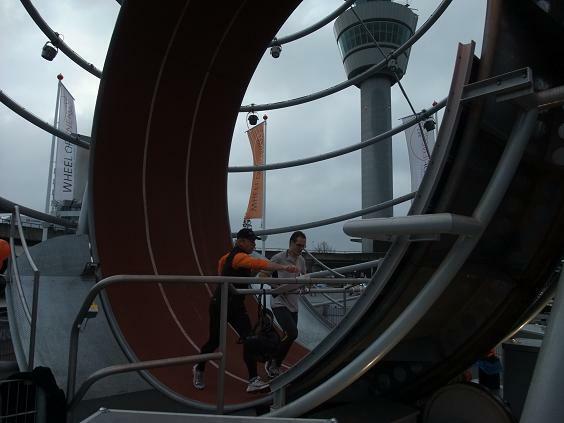 While I was travelling to Lisbon, I made a plane change at Schiphol airport in the Netherlands. Stepping outside for some air (and a smoke) I was amused to see this; A giant hamster wheel being driven round by two runners, raising awareness for a cancer charity. I got a nice deal (free) on a neat little phone with a slide-out keyboard yesterday. 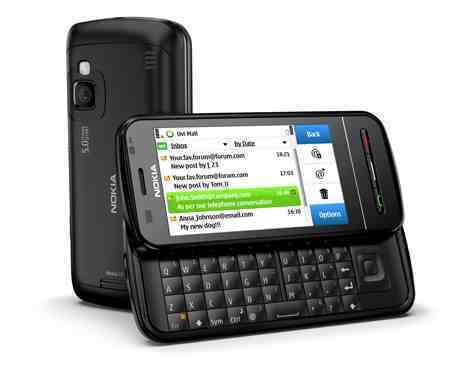 It’s a Nokia C6 Not the latest or fastest smartphone, but good battery life and not too brick-like. WordPress do an app for symbian, so this is a test of it’s capability. First results in from analysis of the Wolff and Patrone paper. P.G. Sharrow has made a seismic analysis showing the likely area of cell overturn releasing potential energy. Top work P.G.! I will be able to plug this value in to the model I’m building with Rob Prince. The left gauge is seismic speed and the bottom is solar radius. 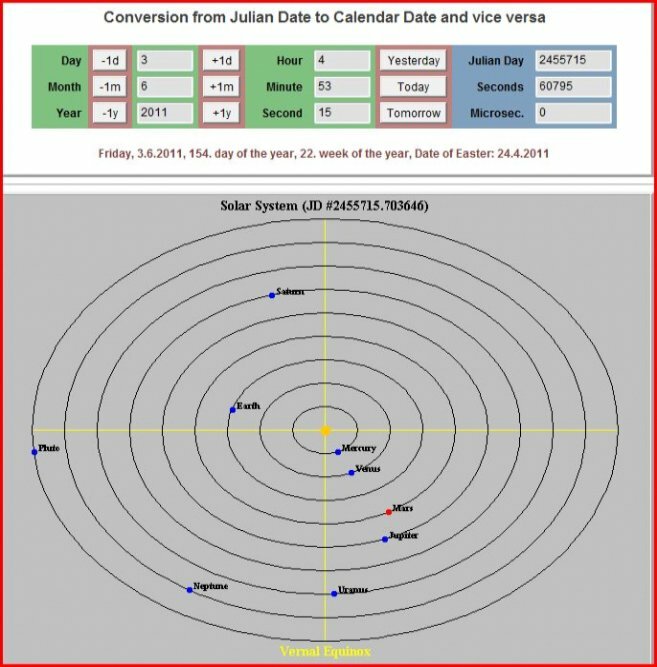 On the recent barycentric orbital periods thread, Roy Martin commented about the apparent rotational symmetry of the solar inertial motion (barycentric radius) about the date 1648. I replied saying he may have found the midpoint date identified by Semi in his paper ‘Orbital resonance and Solar Cycles’. Late last night the sky cleared, so my friends Rob and Johnny and I drove up out of the orange glow syndrome to the top of the Chevin, a hill near where we live. To assist our Stargazing we took Johnny’s new toy with us, a nice 10″ Dobsonian “Stargazer” telescope with 40x and 120x eyepieces. Johnny and Rob hunting for the Andromeda Nebula. The red spot to the right is an aircraft warning signal. 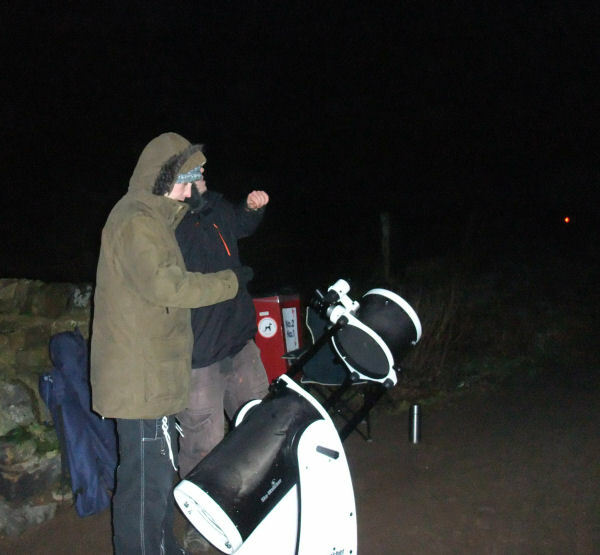 We set it up away from the carpark up on the ridge and got some great observations of, amongst others, the Orion Nebula, Jupiter and its four main moons, and of course, our own Moon. 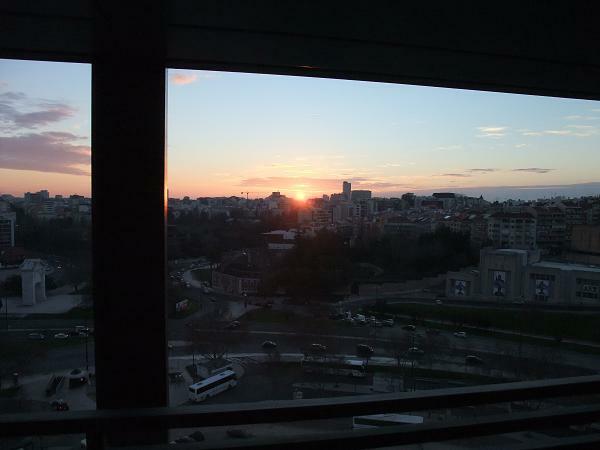 See the photo I managed to get below the break. As regulars know, I’ve been invited to attend a conference sponsored by the Joint Research Council of the European Union in Lisbon at month end. I’ve now received the agenda which details some of the aspects of the climate debate which will be under discussion. I can’t be completely specific at this point, because there is flexibility in the format of discussion and topic list and we have been invited to put forward ideas. I’d like to help represent as many views as possible from the blogosheric climate community, so please put forward your views so I can raise issues at the conference. 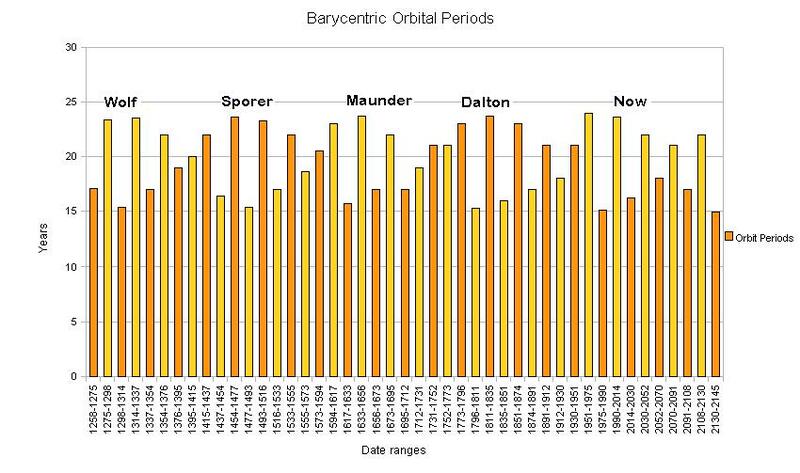 Gerry posted a comment with the barycentric orbital periods and said plotting a bar graph would reveal interesting patterns. So I did. I also marked on the solar grand minima Gerry added to the data. These time periods relate to the motion of the Sun around the centre of mass of the solar system. Here’s a plot of the motion so you can get an idea of what this is about. 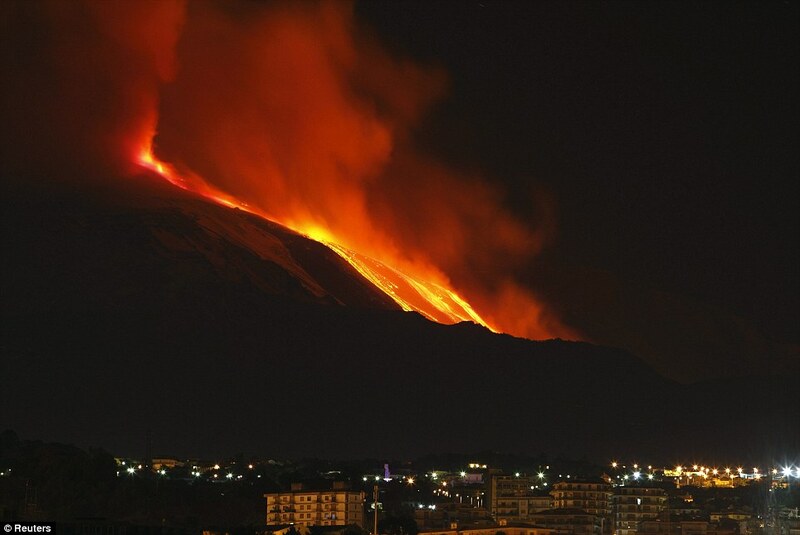 Other major 20th-century eruptions occurred in 1949, 1971, 1981, 1983 and 1991–1993. I did consider the hardback but as there is no index, and kindle e-books are searchable, I went the high tech route. My fiancee kindly downloaded it to the Kindle e-book reader I bought her for Christmas. Now I just have to prize it from her fingers long enough to read Mles’ highly entertaining and thought provoking material. The first edition of the paperback is on back-order from Amazon UK here. There are only two copies of the hardback left, an astute investment at £24.22 if you ask me. So that we can keep all people’s ideas in play while there are a couple of discussions continuing on papers concerning specific mechanisms by which planets have an effect on the Sun’s activity, here’s an open thread for the interchange and expression of ideas and concepts. As I find time today and this evening, I will try to summarise and explain each of the mechanisms considered plausible by the scientists and thinkers who have offered them for consideration. 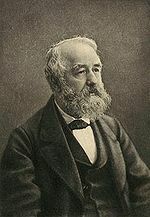 Tucked in the footnotes to the Wolff and Patrone paper is a curious reference to an ‘Extract of a letter to Mr. Carrington.’ from none other than Rudolf Wolf (1816-1893), the famous solar observer and creator/curator of the best and most complete sunspot time series then in existence. The letter extract was printed in the monthly notices of the Royal Astronomical Society Vol 19 p85. Wikpedia doesn’t tell us much about Wolf, and it certainly doesn’t mention that he was a solar-planetary theorist! Leif Svalgaard has never mentioned it either, until I asked. The Letter is reproduced below the break. The days of Leif’ Svalgaards ‘The sun is in perfect freefall and thus feels no forces’ idealisation are numbered. In freefall it may be, but it is subject to significant differential forces, not only from tides, but from the varying angular momenta of cells within it which do not cancel out. 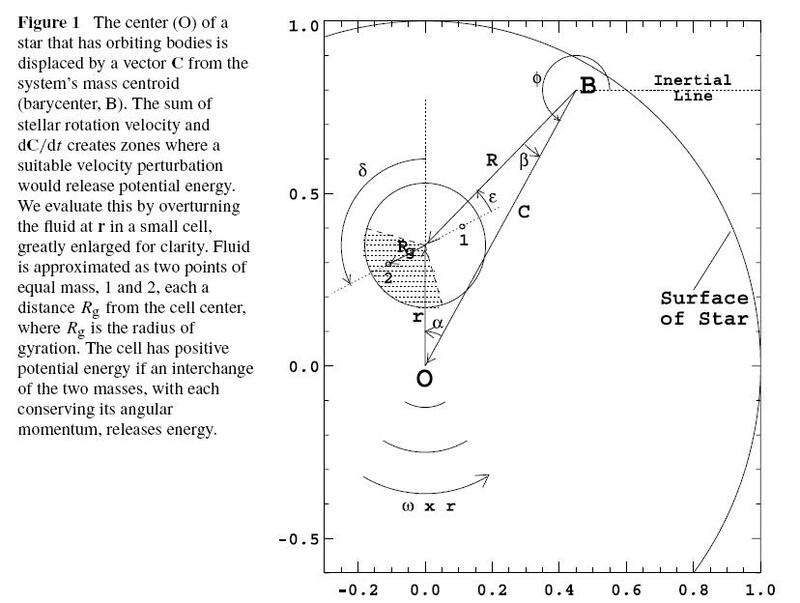 We derive a perturbation inside a rotating star that occurs when the star is accelerated by orbiting bodies. If a fluid element has rotational and orbital components of angular momentum with respect to the inertially fixed point of a planetary system that are of opposite sign, then the element may have potential energy that could be released by a suitable flow. We demonstrate the energy with a very simple model in which two fluid elements of equal mass exchange positions, calling to mind a turbulent field or natural convection. The exchange releases potential energy that, with a minor exception, is available only in the hemisphere facing the barycenter of the planetary system. We calculate its strength and spatial distribution for the strongest case (“vertical”) and for weaker horizontal cases whose motions are all perpendicular to gravity. The vertical cases can raise the kinetic energy of a few well positioned convecting elements in the Sun’s envelope by a factor ≤ 7. 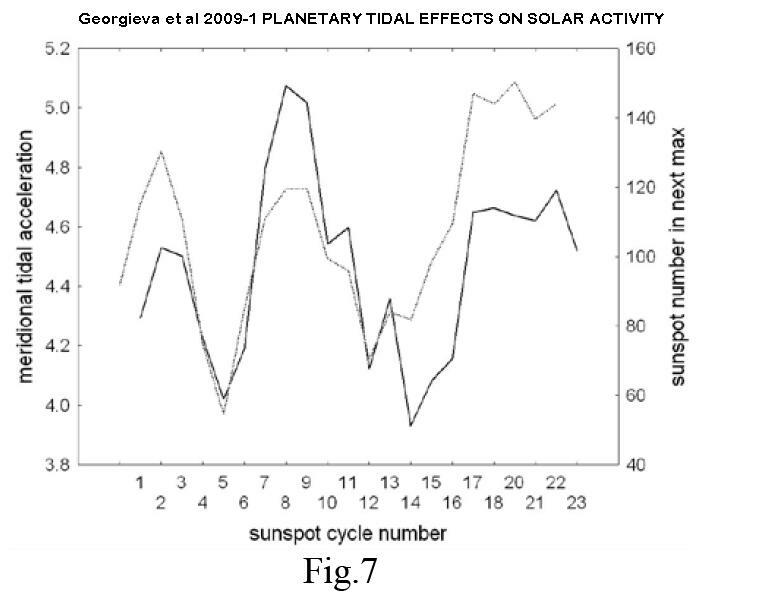 This is the first physical mechanism by which planets can have a nontrivial effect on internal solar motions. Occasional small mass exchanges near the solar center and in a recently proposed mixed shell centered at 0.16Rs would carry fresh fuel to deeper levels. This would cause stars like the Sun with appropriate planetary systems to burn somewhat more brightly and have shorter lifetimes than identical stars without planets. 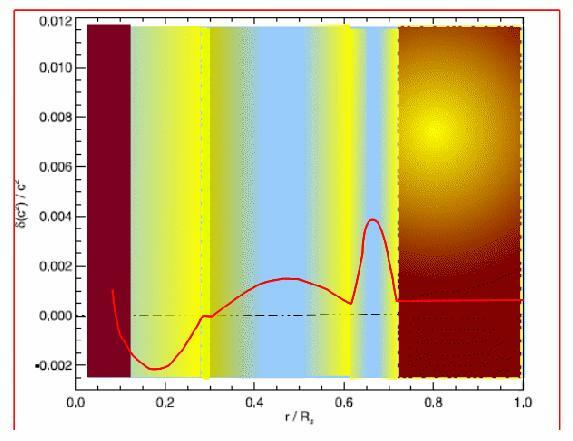 The helioseismic sound speed and the long record of sunspot activity offer several bits of evidence that the effect may havebeen active in the Sun’s core, its envelope, and in some vertically stable layers. Additional proof will require direct evidence from helioseismology or from transient waves on the solar surface. I’m protecting the anonymity of the person who said this until I hear from them that it’s ok to attribute it. I was tasked with determining whether to shut down the UARS spacecraft program. One of the justifications for keeping it operational was that it was one of the prime data source for Ozone Hole monitoring. When presented with the record of ozone hole max/min extent, it was obvious that “the Hole” somehow was ignoring all the hype, the “science” and the politics. Since I knew the person who “discovered” the Hole, I asked him about it. The answer was that the Hole was real, but the “science” was pure hype. His theory was that it was a natural occurrence that varied on a periodic basis based on factors that were never later pursued. 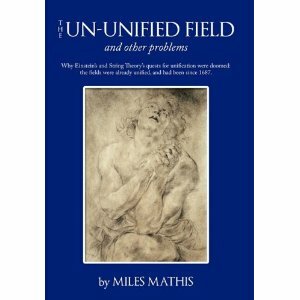 He was NOT the person who was credited with discovering the Hole – that person stole the credit by pubishing first. So the suggestions thread doesn’t get cluttered, here’s an open thread for people to contribute whatever they want to on the subject of the Electric Universe hypothesis. The Secrecy surrounding the MET’s severe weather warning to the cabinet office which never got to the public deepens. 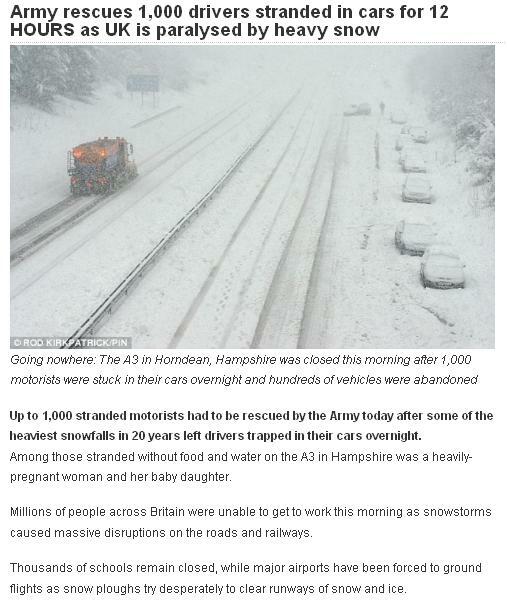 Now the cabinet office refuses to confirm or deny whether they conveyed the MET weather warning to the appropriate agencies such as highways, local government transport executives etc. After my none to successful attempt to wring information from my local M.P. Benny Peiser of the Global Warming Policy Foundation has taken up the baton and asked a whole bunch of awkward questions of Louise Ellman MP, Chair of the Transport Select Committee. Piers Corbyn of Weatheraction is jubilant, and has a video up on youtube outlining his successful winter forecast.